There was a time when meeting up with a friend for coffee gave you the obvious choices – Cappuccino, Latte, Flat White, Espresso etc. But those days are long gone – with the introduction of a number of different varieties. The list of options is growing from strength to strength especially with the increase of the healthier way of living life; together with the increase of dietary requirements such as Gluten Free, Dairy Free etc. Most recently, some people of Melbourne were outraged by the posting from Jamila Rizvi of her deconstructed coffee. What is deconstructed coffee you ask – it comes served on a paddle, in three separate cups, or test tubes, beakers in some cases — one with espresso, one with milk and one with water. Having the same ideal as a DIY coffee you can put exactly how much water and milk you want – essentially creating your perfect cup of coffee. It is thought that this trend hails from London; with this trend having both its haters and lovers. I myself haven’t tried a deconstructed coffee but seeing as I can just make myself one at home; I am on the not-a-fan bandwagon. Yep there are that many! Let’s delve into a bit of detail about each of these lattes. The Matcha Latte – these have been around for a few years at select cafes; but you are starting to see more and more cafes embracing them. Matcha tea is the finely ground powder of specially grown and processed green tea. Unlike traditional green tea leaves, which are steeped in water and then discarded, matcha powder contains the whole ground tea leaf, which is ingested whole. The taste and nutritional benefits are vastly different to standard green tea; matcha has a softer, creamier flavour and contains up to 10 times the antioxidant content of standard green tea brews. Green tea leaves contain high levels of antioxidants known as polyphenols. These help to protect against heart disease and cancer, and are known to have anti-ageing properties. Because matcha tea contains whole leaves it has a significantly higher concentration of antioxidants compared to steeped green tea. It also contains good amounts of healthy compounds such as chlorophyll, which gives it the bright green colour. Matcha Lattes are an acquired taste – but I personally love them! I am also a huge fan of anything green tea related so that maybe why. It has a very robust taste but coupled with the milkiness of a latte has a creamy undertone. I would highly recommend you try one for yourself. Matcha Lattes are appearing in quite a few cafes – too many to name – but here are a few that do – White Mojo (Melbourne CBD & Balwyn), Fourth Chapter (Prahran), Serotonin Eatery (Burnley), Too Many Chiefs (Brighton), Eden’s Backyard (Carlton), Street Organic (Malvern), Matcha Mylkbar (St Kilda). The Beetroot Latte is something that is quite new – it is created to balance the power of a superfood together with a hit of coffee. Some cafes use organic Beetroot powder mixed with Almond Milk ( Real Food Organic in South Yarra) whereas others use freshly pressed beetroot juice, fresh ginger, original almond mylk (Matcha Mylkbar in St Kilda). 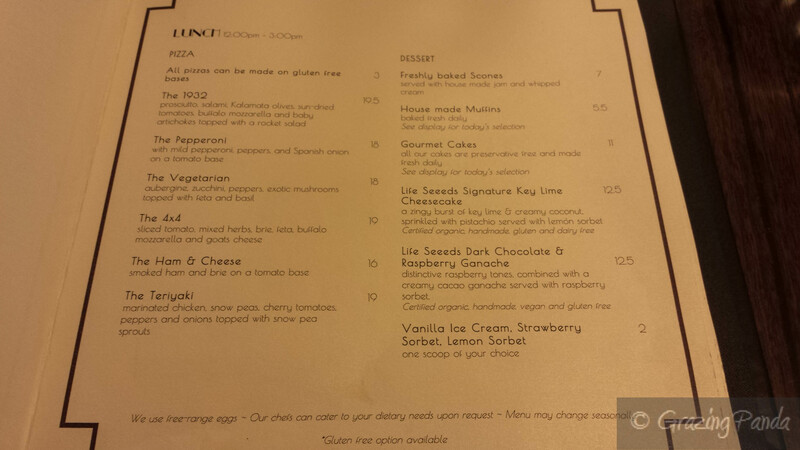 Meanwhile at Happy Place in South Melbourne; they do a caffeine-free Beetroot Latte infused with Hibiscus. The Happy Place Beetroot & Hibiscus Latte was the one I tried – it reminded me of a smoothie but warm – it literally was a nice warm hug on a cold and breezy Melbourne day. Happy Place is a holistic lifestyle cafe; located at South Melbourne Market- recently opened by Melbourne coffee pioneer Salvatore Malatesta and celebrity nutritionist Lola Berry. The basis of the cafe is it’s gluten-free, dairy-free, refined sugar-free and FODMAP friendly. The cafe is targeted mostly at take away (there are about 8 window seats) – with a mix of Chia Puddings; Mix and Match Salads together with Bone Broth (which is Paleo). Additionally there are Cold Pressed Juices and Smoothies (which are mostly fructose free) as well as the hot drinks (they do Tumeric, Carob and Mushroom Lattes too – all caffeine free). Oh they also have Crystal Infused Water! And if you are looking for something sweet – they do have raw cakes with flavours such as Mint Slice, Key Lime Pie, Cherry Ripe and Snickers Bar to name a few. I am usually not a fan of Cherry Ripes – however I did try Happy Places’ Raw Cherry Ripe which was scrumptious! Back to the Beetroot Latte – I am interested to try another one – this time one which has the caffeine mixed in with it to see if it does taste any different. It has officially been put on the to-do list! 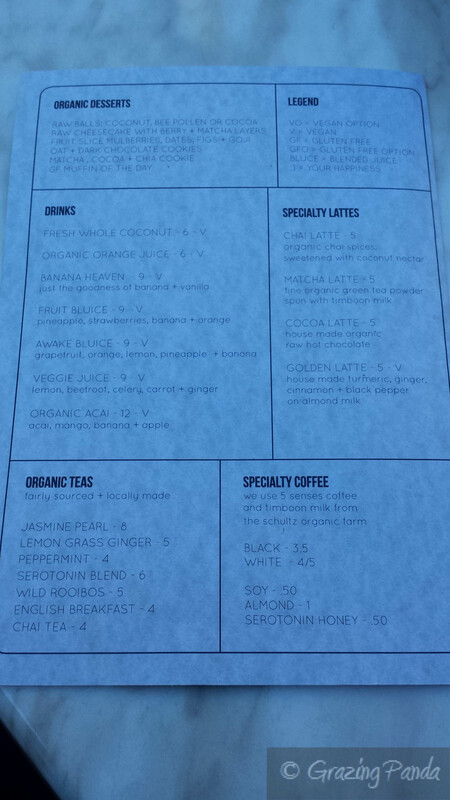 Turmeric lattes sounded rather interesting to me. I have always known Tumeric is great for you and has an abundance of health benefits such as incredible anti-inflammatory properties, and has been used medicinally in South Asia for over 4000 years! Tumeric Lattes are also affectionately referred to as Golden Lattes. There are many different ways to make Tumeric Latte – most consist of Tumeric, Cinnamon, Ginger and a variety of other spices which could include pepper and even cayenne pepper as the base mixture. This is then combined with either cow’s milk, coconut milk or nut milk. It is believed that some spices such as black pepper, help to absorb the essential nutrients of the tumeric; further enhancing the anti-inflammatory and immune system aiding properties. Coconut Milk is suggested as the best alternative for Tumeric Lattes as it doesnt separate out and enhances the spice flavour. “Tumeric Lattes” have been around for centuries especially in the Indian culture – it is called haldi doodh in Hindi, which translates to Tumeric Milk. This version of the blend has cardamom, clove, ginger, nutmeg, turmeric, pepper, cinnamon, brahmi and ashwagandha (Indian spices) made together with a coconut-and-almond-milk blend. If you wanted to make it for yourself at home you can buy different Tumeric blends available around Melbourne and Sydney. I had my first Tumeric Latte at Matcha Mylkbar, located in St Kilda. Matcha Mylkbar is a vegan cafe by Nic Davidson, Sarah Holloway and brothers Mark and Attil Filippelli. They are renowned for selling bright-green burger buns, vegan eggs and of course their different types of lattes including Matcha, Tumeric, Mushroom and the newest addition Blue Algae lattes (I will go onto talk about these too!). They also have great Pun-Fully named smoothies which come served in a skull glass – epic! My first sip of the Tumeric Latte was intense to say the least – it was a massive kick to the back of your throat with spicy richness. It almost felt like I was eating a face mask I have used before (=p ); however as you take more and more sips it really does grow on you. I really enjoyed it after a few more sips and even welcomed the spiciness. A definite must try. Mushrooms are one of my favourite veggies! However I am a bit apprehensive about how they would go in a latte form. I have yet to try a Mushroom Latte but definitely do want to try one out. What is a Mushroom Latte you ask – it is made with almond milk and sweetened with vanilla spice and agave mixed together with a Chaga Mushroom Blend. Going from the reviews – it apparently doesn’t taste like mushrooms. Stay tuned – I will update this post once I have tried one! Moving onto the Rainbow Lattes and Rainbow Coffees – both of these can be found at Too Many Chiefs in Brighton. Rainbow Latte / Flat White / Hot Chocolate is essentially your standard coffee fix with the use of food dye in the milk used to form Latte art. Rainbow Coffees however are the healthier alternative and created by the owners of Too Many Chiefs; is free from caffeine and is made out of turmeric, beetroot and matcha. This gives you your Vitamin C fix, fights the flu, boosts immunity and acts as an anti-inflammatory all in one. Wow! To be quite honest it wasn’t until deciding to write this post did I know there was a difference between a Rainbow Coffee and a Rainbow Latte. When I am in the area I do want to try out what a Rainbow Coffee tastes like! Now onto the latest hipster trend taking Melbourne by storm – the Blue Algae Latte / Blue Latte or Smurf Latte. Yep that’s right it is actually Blue in colour. My favourite colour is blue – but having a “latte” that is in that colour I am not so sure about. That and the fact that it has algae in it – what the? So just what is the Blue Algae Latte made of – it is a concoction of lemon, ginger, coconut, agave and E3 Live Blue Majik – a powdered and super expensive blue algae. It does cost $8 to try – and has no recorded health benefits. Since I haven’t tried it myself I took to the reviews to find out just what it tastes likes. According to people who have tried it – the first mouthful was prominently sweet, gingery taste before changing to a funky sourness that lingered. Of course this isn’t everyone’s cup of tea (pun intended); but just like with anything you will have your lovers and haters. I am still on the fence if I want to try out the Smurf Latte – but never say never! Another coffee morning brew is the red velvet creation that I found a lot in Sydney cafes – The Locak Mbassy is one such cafe. The Red Velvet Latte tastes exactly like a Red Velvet Pancake along with the cream-cheese-esque butter cream and hints of popcorn. It really is quite rich and delicious all at once. I am yet to see the presence of the Red Velvet Latte in any Melbourne cafe. Another latte made famous via Instagram is the Pink Tea Latte and Yellow Tea Latte. This craze started all the way from Geelong at a place called Cha Cha Tea (You can find this available at King of the Castle Cafe – Pakington Street, Geelong) – with Sam Manning the girl behind the coloured tea lattes. Cha Cha Tea mixers is essentially tea without the hassle of boiling or infusing with no added preservatives and unnecessary sugar; and are easy to make by adding sparkling water (or normal water), champagne or even an espresso martini – your choice really! There are currently two flavours – Strawberry Swoon (Pink!) and Peeling Fantastic (Yellow!) tea lattes available – with more flavours to come. The Strawberry Swoon Tea Latte aka Pink Tea Latte is a blend of Rosehip, Hibiscus, Strawberry, Beetroot and Apple and is sugar-free, Caffeine-free, Packed with Vitamin A and C and is also vegan friendly. You can purchase one from St Rose Cafe in Essendon or as mentioned above King of the Castle Cafe. And thus concludes my visibility into the world of lattes – please do comment below if you have tried or know of any different “latte” available in Melbourne. Would love to hear your experiences. Also follow @simtiaz_grazingpanda on Insta for daily foodie updates, stories and travels! It was a Friday night date night and we decided to eat in the city. I remembered hearing about a new restaurant that had opened up called Woody P. It was earlyish – around 6:30pm so we decided to see if we could get a table without a booking. We were able to score some high seats by the window with a view looking into the kitchen area and were told that when a table becomes available they would move us. Perfect! Woody P is located on Flinders lane in the heart of the Melbourne CBD – with neighboring restaurants such as Chin Chin, Coda and Cumulus Inc. Woody P is brought to us by Pierre Semaan and Robert Rae who previously owned Fashion Lounge – the nightclub – which is the very place that Woody P has taken over. Woody P has such an interesting space which has been designed by Eades and Bergman (who have also designed Kong and The Meatball and Wine Bar). As you are about to enter the restaurant – you know you are at the right place when you see a neon blue W sign out the front – and if you look down – the WOODY P name made out of small tiles. The venue spans over two floors complete with a combination of exposed brick walls, wooden floors, blond wood and marble – what a combination! The restaurant is artfully sectioned off into distinct areas – separated by exposed brick beams on one side and indoor suspended greenery (planter boxes) on the other side. The front section is for casual walk-ins, with a semi private area just behind it, followed by a marble bar with mosaic tiles for cocktails and towards the back overlooking the kitchen – high table seating. I love the brightly lit blue neon sign “When in Rome” which works beautifully against the exposed brick wall which catches your eye as you walk towards the bar. There is also a terrace for outdoor seating to dine al fresco once the sun comes out in Melbourne! The menu has both Italian and Mediterranean influences and has been created by head chef Clinton Camilleri (Eleonore’s, The Lake House, The Royal George Hotel). The menu pretty much has something for everyone – from White Anchovy, Caramelised Onion, Puff Pastry starters to 48-hour Slow Cooked Beef Rib, Roast Onion, Gremolata to a selection of Pizzas and Pastas. 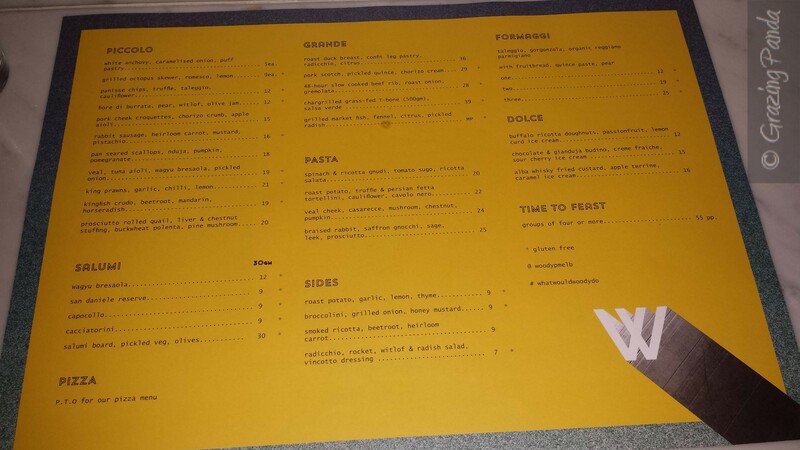 The menu is split into 8 sections – Piccolo (Entrees), Salumi, Pizza, Grande (Mains), Pasta, Sides, Formaggi and Dolce (Dessert). You can select the “Time to Feast” menu for $55 per person for groups of four or more. The Pizza menu can either be Eat In or Take-Away and to view the list available to choose from you simple flip over the menu given to you. There are 7 pizzas to select from including Margherita, San Daniele, Gamberi, Funghi, Patatina, Zucca and Porchetta. N and I were seated at the high tables and were given the menus in case we wanted to have some snacks whilst we waited for our table. We were also asked if we wanted sparkling water which we said yes to. The sparkling water was from Bolle Stille and was better than any of the sparkling waters I have tasted around. 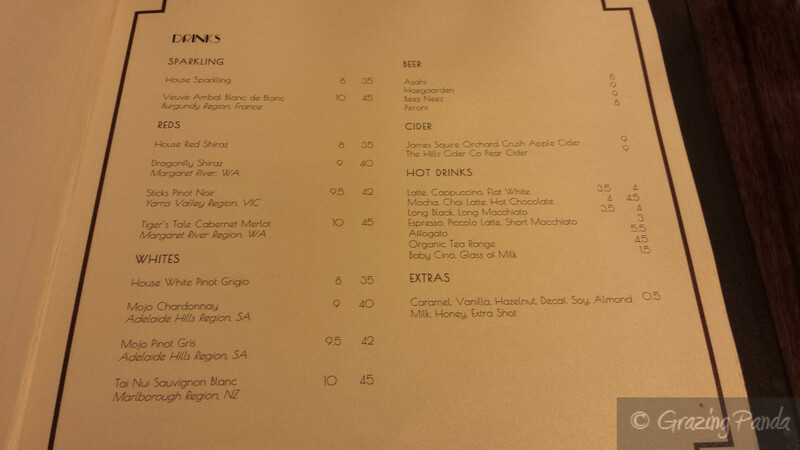 Before deciding on what snacks/entrees we wanted we decided to order a drink. I asked what mocktails they had available and the friendly waitress informed me that there were two options – I ended up going with the Peaches & Cream. I have never come across a place that does a Peach mocktail so I was very interested to see what this was all about. The mocktail came out and just like the drink had peachy tones completed with a wedge of lemon – and tasted spectacular – exactly as you would imagine peaches and cream to taste like – slightly sour with a great creamy after taste! Delicious and definitely highly recommended! It was time to decide what food to eat – we ordered the Panisse Chips, Truffle, Taleggio, Cauliflower to start while we thought about what we wanted for our mains. I had never heard of Panisse before so was intrigued to see what it was like – essentially it is reminiscent of polenta and comes served in fingers which resemble fries. The exterior was crumbed perfection with the inside reminding me of custard – I would have liked a bit more seasoning to the flavour such as salt and pepper but overall it was an interesting dish. For mains I decided to go with the Spinach & Ricotta Gnudi, Tomato Sugo, Ricotta Salata and N went with Chargrilled Grass-Fed T-Bone (500gm), Salsa Verde. We also decided to get the Broccolini, Grilled Onion, Honey Mustard as a side – we absolutely love Broccolini and were interested to try the honey mustard flavouring. My Spinach & Ricotta Gnudi, Tomato Sugo, Ricotta Salata was a beautifully presented dish – the Tomato Sugo oozed brightness at the base of the dish where the Spinach & Ricotta Gnudi were placed upon and finished with Ricotta Salata and Basil leaves. Gnudi is essentially a type of round gnocchi and Woody Ps take on it was smashingly delicious. The Gnudi balls were generous in size and quite dense in texture with the taste perfect. The Tomato Sugo was rich and complemented the ricotta and spinach fantastically. Overall a good tasting dish. N’s T Bone was styled simply – the steak pieces cut up into bite sized pieces with the salsa verde dressed on top and finished with half a lemon. N thoroughly enjoyed his dish so much so that he didn’t even realise he was eating 500grams of meat! The Broccolini was such a simple dish with bursting flavours that I loved. The Honey Mustard combined with the grilled onions meshed really well with the Brocollini. I think we will definitely be trying to replicate this dish at home! As you all know I cannot leave a place without sampling the dessert menu. It was a tough choice to make but in the end I went with the Chocolate & Giandujua Budino, Crème Fraiche, Sour Cherry Ice Cream – and boy am I glad I did. I was raving about this dessert weeks later! This dessert isn’t just for all Chocolate lovers – but for anyone! Giandujua for those of you who don’t know is a sweet chocolate hazelnut spread and a Giandujua Budino is an Italian pudding made with this spread. This was served with quenelles of chocolate ganache as well as Sour Cherry Ice Cream. The combination of the rich chocolatey goodness combined with the sourness of the ice cream was brilliant. I could actually eat a bowl full of Sour Cherry Ice Cream on its own as well – it was simply divine! On a different occasion (when I went to Woody P for lunch) – I ordered the Roast Potato, Truffle & Persian Fetta Tortellini, Cauliflower, Cavolo Nero. This would have to be my favourite dish from Woody P so far (aside from the delicious Chocolate dessert of course). The dish is immaculately presented – with the cauliflower puree at the base of the dish with the three tortellini placed in a triangle on top – finished with sultanas and Cavolo Nero. It was almost too pretty to eat…almost! From the first bite I was in Tortellini heaven – the combination of potato, fetta and perfectly made pasta was delicious – there was the right amount of seasoning and combined with the smooth creamy cauliflower puree. I am not usually a sultana fan but it really worked in this dish and added a sweetness to the dish which complemented all the other flavours. My only gripe would be that it too small – I would have like maybe 1 or 2 more tortellini – but I guess that’s only because the dish was DELICIOUS! On the same occasion C ordered the Gamberi Pizza – Tiger Prawns, San Marzano Tomato, Chilli, Garlic, Salsa Verde. I was lucky enough to sample a piece and it was quite good as well! When the pizza came out it came served with a little dish that had extra salt, herbs and chilli which I thought was a great idea as usually I have to ask for extra chilli on the side. The base of the pizza was thin, fresh and crispy on the edges with the ingredients all working well together. Woody P is up there with one of my favourite restaurants of 2015 and one that I recommend to people when they ask me for a place to eat in the city! Service is brilliantly friendly and the vibe is welcoming and homely – it is a great place for Friday night drinks or just to have a quiet date night. The music is great and really allows you to let your hair down! Also something to note the Woody P team are still deciding what their downstairs basement space will be transformed into. So stay tuned for something like a relaxed cocktail and wine / cheese bar come next summer. Atmosphere / Ambience: Funky, Vibrant, Relaxed and Welcoming. Great for Friday Night drinks or Date Night. Alternatively it is also a great place to grab lunch during the week. 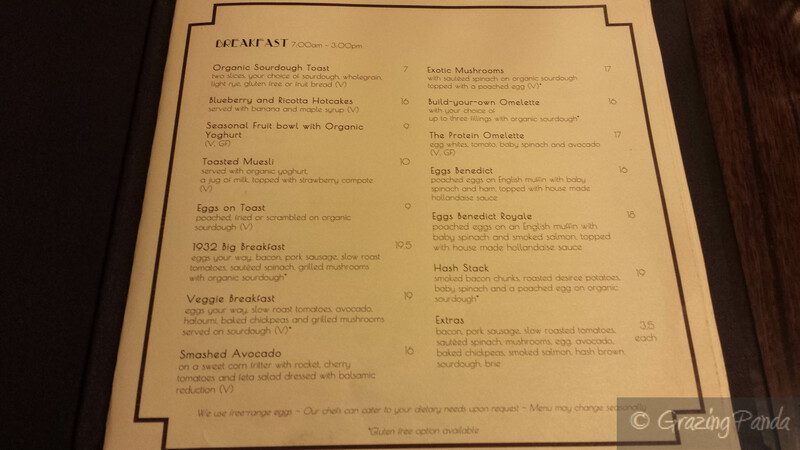 1932 Cafe & Restaurant – 30s Glamour & Great Food! 1932 Café & Restaurant – which has taken its name from the construction date of the building – is a charming Art Deco venue that boasts dark wood and plays music true to its time. It feels like you are stepping back in time and it leaves you mesmerized. The main wall has a multitude of pictures that are a combination of black and white pictures of the Manchester Unity Building from back in the day and colourful pictures depicting the 30s era. 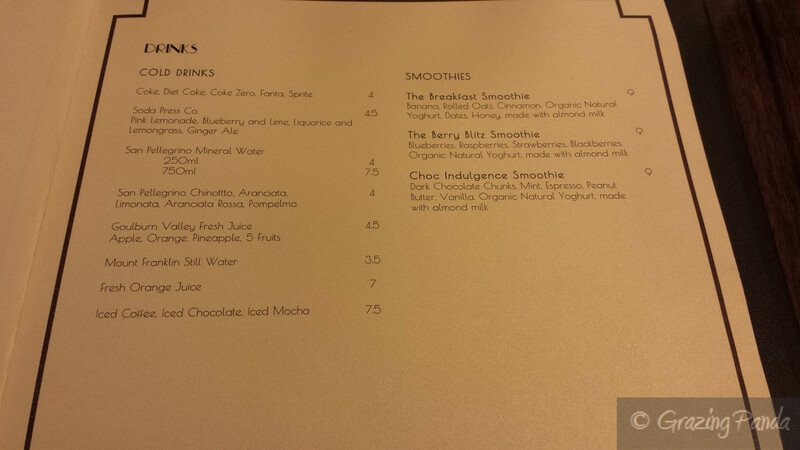 I am welcomed by the staff and shown to my table where I peruse the menu whilst waiting for my Latte. The Breakfast menu (served from 7am – 3pm) has quite a variety to choose from – 14 different dishes – which include Smashed Avocado, Blueberry & Ricotta Hotcakes, The Protein Omelette (you can build your own as well!) and Hash Stack. The Lunch Menu offers the same great variety and is offered from 12pm – 3pm. Dishes include a selection or burgers and sandwiches, baguettes & toasties (which are made fresh daily), salads and Pizzas (you can choose from 6 different types and as a bonus all the pizza can be made on gluten-free bases!). There is also a Soup, Roast and Pasta of the day which the staff will inform you about. The Dessert menu (the most important menu in my mind =p) include Freshly Baked Scones, House Made Muffins, Gourmet cakes (which are made fresh daily and are preservative free), selection of ice cream and sorbets as well as two options from Life Seeeds (Signature Key Lime Cheescake and Dark Chocolate & Raspberry Ganache). The drinks menu is quite extensive as well and includes Smoothies, the usual cold drinks including Iced Coffee, Iced Chocolate and Iced Mochas, Beer, Wine, Cider and hot drinks. I was tossing up between the Smashed avocado, Blueberry and Ricotta Hotcakes and the Exotic Mushrooms – in the end I decide to order the Exotic Mushrooms – with sautéed spinach on organic sourdough topped with a poached egg – and I ask to add some avocado. The dish comes out plated beautifully – the mushrooms and sautéed spinach placed on top of the sourdough and finished with the perfectly poached egg with the avocado fanned out to the side. The flavouring of the mushrooms were delicious and they were cooked just right – still juicy and tender – paired with the runny yolk of the poached egg and the avocado – it really did make for a great tasting dish. The latte I ordered definitely hit the spot – nutty and full bodied richness. After a quick chat with the manager about the refurbishment and about the menu – she asked me if I had room for dessert. I decided to have a look at their colourful cabinet of cakes and slices and decided to go with the Strawberry Tart – which came served with either Ice Cream or Fresh Cream – I opted for the Fresh Cream. The strawberries were fresh, juicy and semi-sweet which paired perfectly with the sweet cream and thin crust. Once the eating was over it was time for the tour of the interior levels of the historic Manchester Unity Building. We headed up the escalator – which I was surprised to learn was the first escalators in Melbourne. This escalator used to lead to the first-floor mezzanine shops but today they lead up to Smile Solutions – Melbourne’s Home of Dentistry. I was shown some of the Smile Solution suites which used to be individual shops before. Next we took the original elevators to visit the famous boardroom located on Level 11. The majestic boardroom table is clearly the highlight of this room – measuring around 6 metres by 1.8 metres, was crafted out of Queensland maple cross-banded with rosewood. It is topped with a single sheet of plate glass that alone weighs some 330 kilograms. The glass had to be produced overseas and delivered to Level 11 through the ceiling as it was too big to fit through any doorways or windows. And what is magical is that it has survived all of the building’s refurbishments. I was also shown the fine china and ornamental pieces that are only ever used for special occasions, as well as pictures of the very first board meeting and its members. Another interesting item found was a pair of workers shoes which are placed near the boardroom entrance to signify the history. It really is unimaginable the amount of history and stories that are stored in one place. Next we visit the breathtaking Rooftop and Tower – which has the most amazing views overlooking the city and allows you to get a closer look of the Manchester Unity Towers. The tower also houses dentist chairs and if you have a look at the picture – it really is a treat to have your dentist work done from these chairs as you have the best view. If you are usually fearful of what dentist’s visits might bring – then this place is for you as you will be definitely distracted with the amazing view. I had a great time not only eating and enjoying the ambience at 1932 Café & Restaurant but getting a chance to witness the iconic Manchester Unity Buildling and its architectural wonders. It truly was a magnificent experience – of which I thoroughly enjoyed every minute. Pictures don’t do this place justice – you really do have to see it for yourself. And now you get a chance as Manchester Unity Building has teamed up with 1932 Café & Restaurant this year to introduce an exclusive “Meal & Tour” experience. The “Meal & Tour” experience includes luxury breakfast or lunch, including champagne, nibbles and desserts at 1932 Cafe & Restaurant before embarking on a formal guided 1 hour tour of the famous Level 11 Boardroom, Level 12 Rooftop and Tower of the Manchester Unity Building. 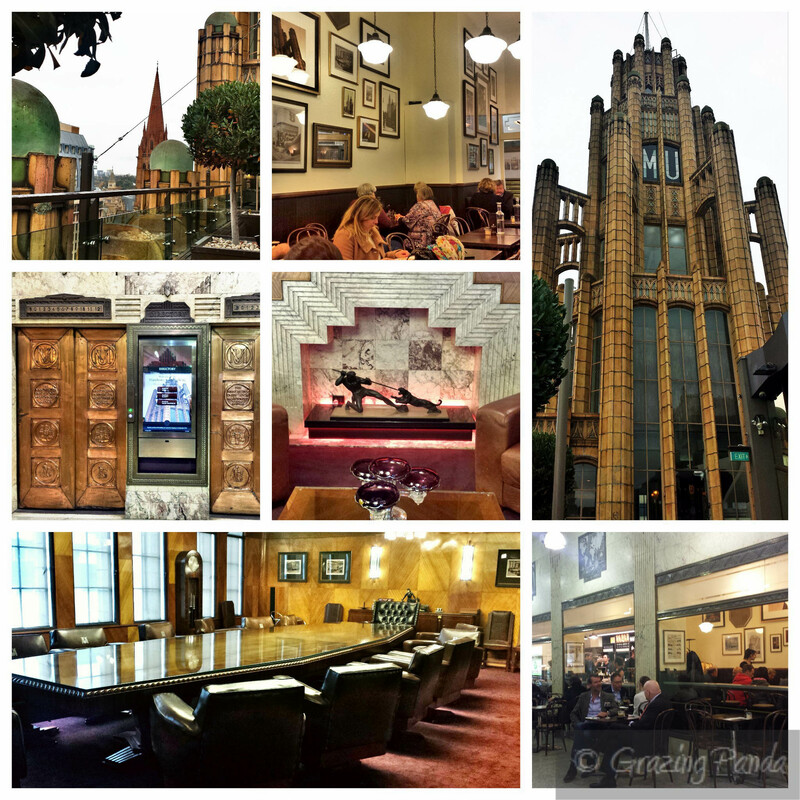 The Manchester Unity Building is one of Melbourne’s most loved architectural icons. Built in 1932 to a record-breaking schedule of works that has never been surpassed, it captured the imagination of Depression-era Melburnians and quickly became a symbol of economic recovery. Today the building attracts thousands of visitors every year and receive a considerable number of enquiries from people who dream of touring its interiors. We are pleased to announce that the Manchester Unity Building has teamed up with 1932 Café & Restaurant this year to introduce an exclusive “Meal & Tour” experience. 1932 Café & Restaurant is a brand-new art deco–inspired breakfast and lunch destination in the arcade of the Manchester Unity Building. The restaurant’s 1930s era theme showcases the history of the building itself. Atmosphere / Ambience: A Step Back In Time – Fun, Welcoming and Warm! I was looking at Instagram one night and came across a picture of a café that had swing seats – when I clicked through I was surprised to see that the cafe was located right here in Melbourne – Richmond to be specific. 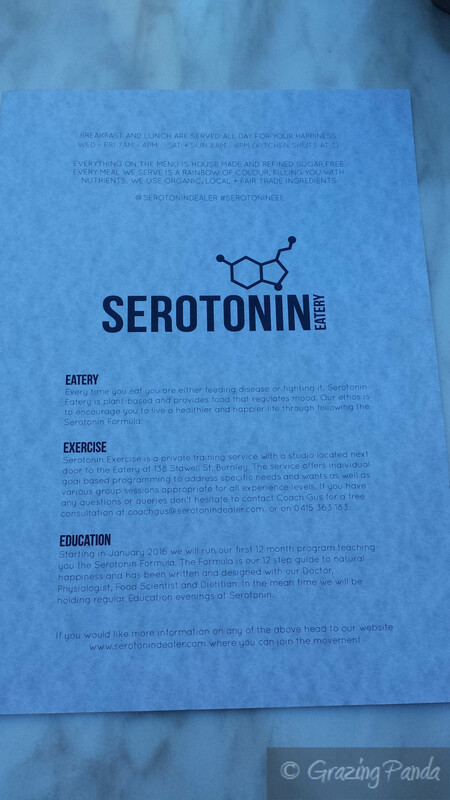 The place was called Serotonin Eatery. With such an interesting name I was intrigued and clicked through to the website. I was greeted with a large banner that said The Science of Making you Happy! This was a café that was all about making you feel happy, being positive and sharing happiness with a smile. Their main vision is to be the world’s leading Happiness Educational Institution – what an awesome vision to have! I couldn’t wait to check out this place (and between you and me – the swing seats too!!) – so much so that I went there during my lunch break at work! Serotonin is the brain child of Emily Hazell – and integrates both a nourishing Eatery together with an Exercise centre (located right next door). The idea is based around eating a plant-based diet to ensure the body, mind and earth all function at their best. Basically you can achieve health and happiness with little effort. Simple! So what exactly is Serotonin? Serotonin is a neurotransmitter that plays a large part in regulating your mood – it is also the chemical that is linked to a healthy appetite, digestion and sleep. Here at Serotonin Eatery – the idea is to deliver a high Serotonin menu that will improve people’s moods and literally put a smile on their dial – as well as providing a sanctuary to escape from our fast-paced lives! Emily has enlisted the help of nutritionists, naturopaths, dieticians, food scientists and psychologists to get not only the menu just right but the feel, look and vibe of the venue. Serotonin sources produce locally from quality farmers and select organic where possible. The entire menu is created by in-house chef – Sean Muir – with each dish featuring produce in its most natural state and assisting in increasing the daily intake of fruits and vegetables of its customers. 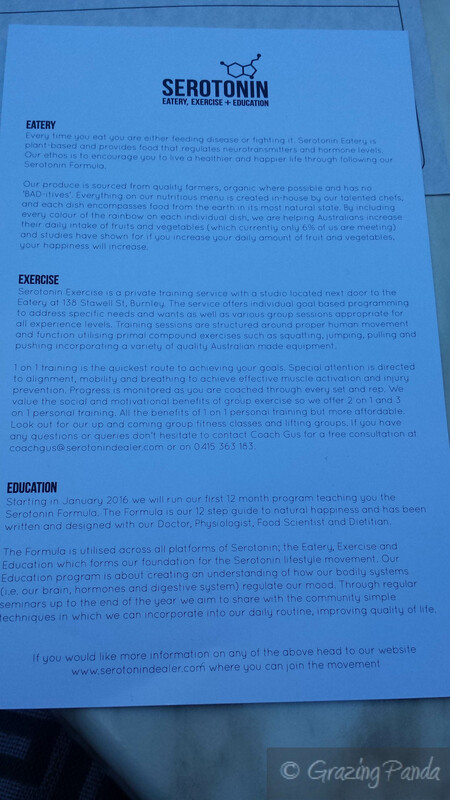 If the great tasting and healthy food wasn’t enough (Serotonin Eatery), you can get healthy in the form of exercise with an on-site personal trainer in the form of Hazell’s brother – Gus Arundel (Serotonin Exercise) as well as wellness education talks (Serotonin Education – you can book these sessions via the website) and regular events like cricket matches, hula classes, acro-yoga…and laughing classes! Serotonin is located in Burnley – right across the road from Bicentennial Park and serves as the perfect location for a café like this! The venue is decked out with wide windows allowing tonnes of natural light to filter through paired together with blonde wooden furniture and bright yellow cushions dotted across the yoga mat style seats and finished with hexagonal tiles – this is the link to serotonin’s chemical structure – smart right? This theme continues with the tableware – hexagonal etched plates, beakers and gold (how cool!!) cutlery. There are three main seating areas (with seven different styles of seating!!) – the day bed style seating that greets you as you enter together with standalone tables and chairs in the front area together with some swing seating by the window, another seating area as you walk past the kitchen towards the back and finally the outdoor seating area – which has a combination of marble topped low tables and swing seats for the high tables which allows you to look into Bicentennial Park. I ABSOLUTELY LOVE THE SWING SEATS (sorry for the Caps – I just really love the idea!!). Customers can also take their meals to the adjacent park – with their food being packed into a picnic basket. 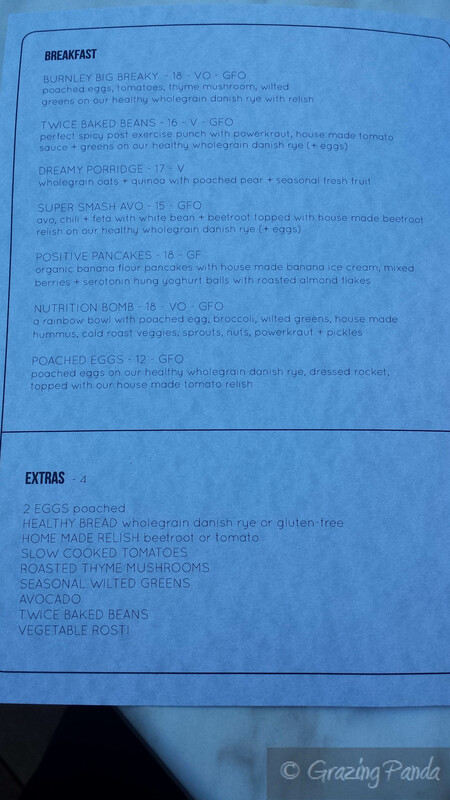 There are seven dishes to choose from the Breakfast Menu which include the Burnley Big Breakfast, Twiced Baked Beans, Super Smash Avo, Nutrition Bomb (a rainbow bowl with poached egg, broccoli, wilted greens, house made hummus, cold roast veggies sprouts, nuts, powerkraut and pickles) and Positive Pancakes just to name a few. 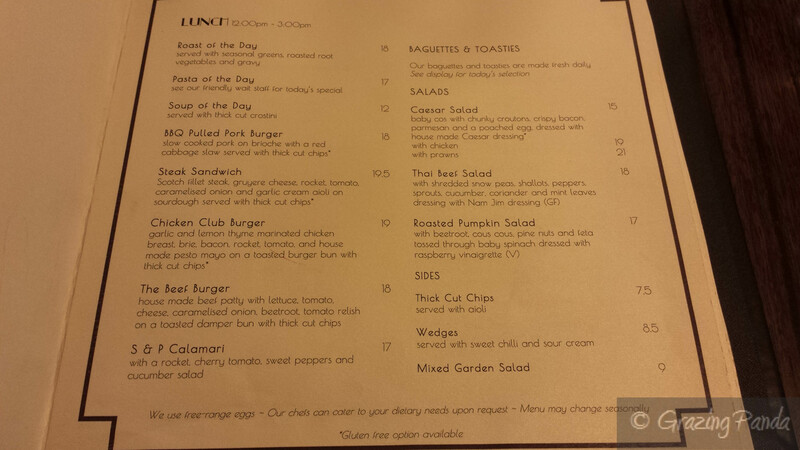 The Lunch menu has eight dishes to choose from including the Smiling Pizza, Hearty Lasagna and Blissful Open Burger. 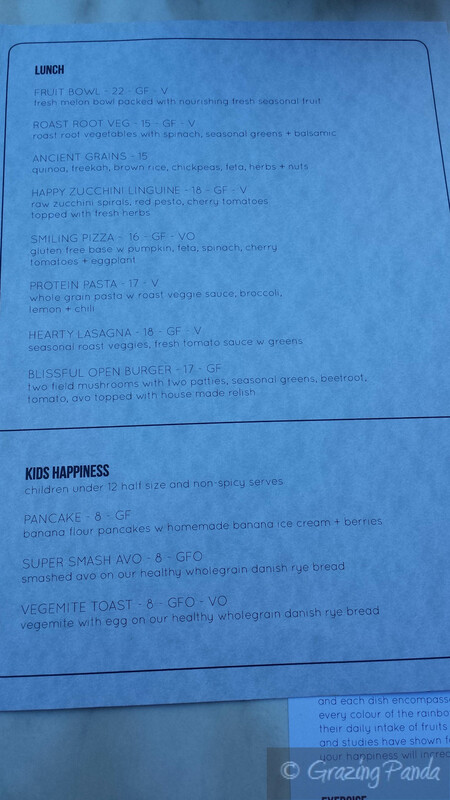 There is also a kids menu with 3 different variations – Pancake, Super Smash Avo and Vegemite Toast. There are a variety of drinks available – organic teas (which are locally made), specialty coffee (Coffee is from 5 Senses and Timboon Milk from The Schulz Organic Farm) and specialty lattes – my favourite! Specialty lattes include – Chai Latte, Matcha Latte, Cocoa Latte and Golden Latte (house made turmeric, ginger, cinnamon + black pepper on almond milk). I couldn’t decide where I wanted to sit – and in the end decided to sit outside in the back where the sun was shining and I had a clear view of the swings. I couldn’t actually sit on the swing seat as I had my laptop with me and needed to do some work. The tables were marble and a cactus in a stone hexagonal shaped vase – simple yet beautiful. Water is served in a conical flask – further adding to the sciency theme of the venue, whilst staying cool and classy. Whilst perusing the menu I ordered myself a Matcha Latte – Fine Organic Green Tea Powder spun with Timboon Milk. The Matcha Latte came out in a beautiful black ceramic cup with honey on the side. The Matcha was strong, rich and perfectly creamy thanks to the wonderful tasting milk. It was my first time drinking a Matcha Latte and I loved it! It took me quite a while to decide which dish I wanted – I was tossing up between the Positive Pancakes, Happy Zucchini Linguine and Protein Pasta. I ended up going with the Happy Zucchini Linguine – Raw Zucchini Spirals, Red Pesto, Cherry Tomatoes, topped with Fresh Herbs. The Happy Zucchini Linguine came out beautifully plated with cheery red sauce and fresh green herbs surrounding the zucchini linguine and topped with a bright yellow lemon wedge. I love that the linguine was actually made out of zucchini – such a brilliant idea to replicate linguine. The flavours worked well together and the additional of the lemon really enhanced these flavours. I loved the slight crunch that came from the linguine which added texture to the dish. There are also Organic Desserts available such as Raw Balls (Coconut, Bee Pollen or Raw Cheesecake with Berry and MAtcha Layers), Fruit Slice, Cookies and a selection of difference cakes daily. On this day they didn’t have any of the Raw Cheesecake so I opted for the Carrot Cake. The Carrot Cake came out presented really well – the main cake in the middle with a scattering of nuts surrounding the cake. The cake itself was soft, moist and filled with plenty of nuts. The flavouring was good – but there was something missing – the cheesecake icing on top was delectable. 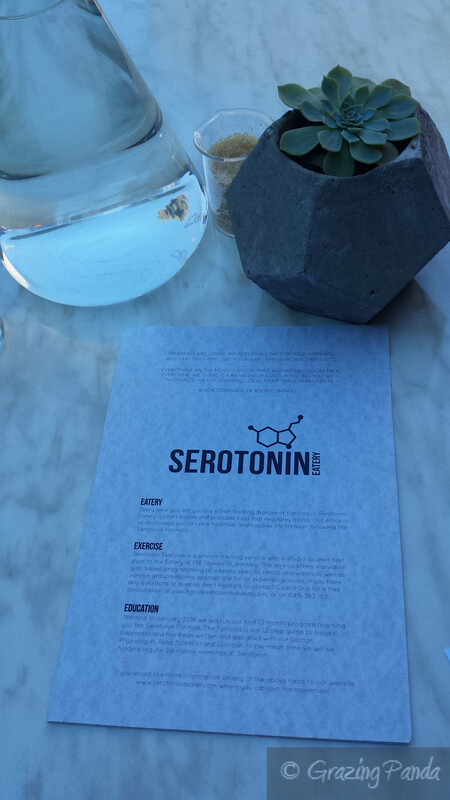 I went to Serotonin Eatery on a working break and it really did work for me – I got a lot of work done! And it really did make me feel a lot better – happier in fact! The staff are really friendly and willing to help in any way they can. Serotonin Eatery is all great food, improving your mood and creating a great experience for you. Check it out ! Service: Fantastic, Friendly and Helpful. 7. At this stage you can still modify your order should you need to. If there are no changes – select Continue. 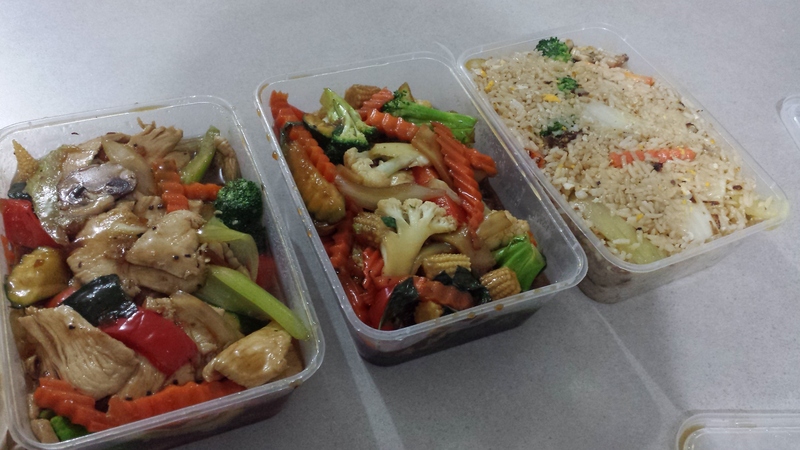 I was invited by EatNow to try their online takeaway feature in order to show the ease and convenience of using this service. 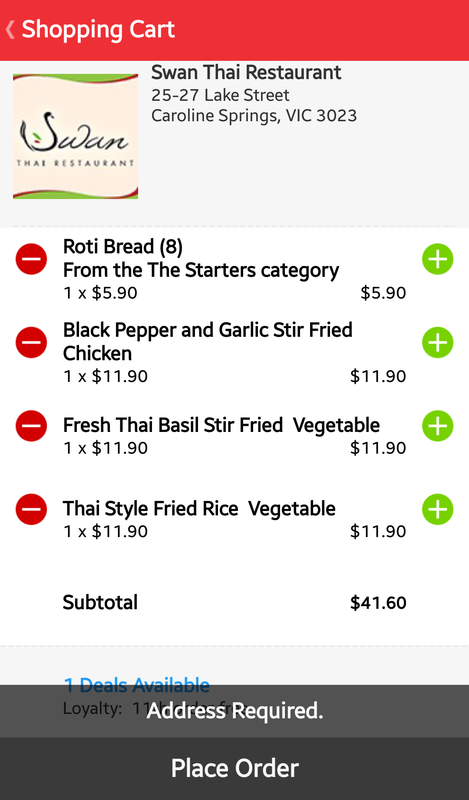 For those of you who haven’t heard of EatNow they are an Australian owned and operated business that was founded in 2010 by a few hungry Australians, that aims to provide excellent coverage for takeway food and home delivery Australia Wide. 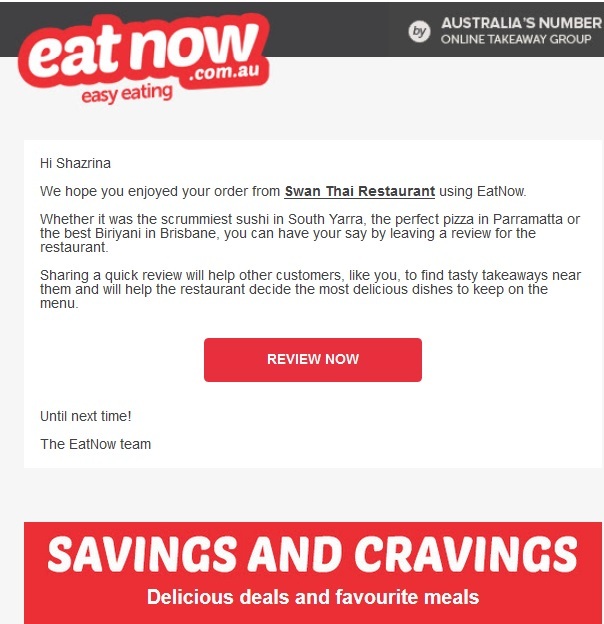 EatNow belong to Australia’s Number 1 Online Takeaway Group – Catch Group and have 4400+ restaurants listed and are continuously looking for new restaurants to add to their list – in fact if you can’t find your favourite restaurant you can suggest it via their website to let them know. There are also special offers and discounts that are offered to you when you make an order – for example the restaurant that you are ordering from could have a special deal. There is no sign up fee at all and the site is free to use – and you receive an instant SMS confirmation once your order has been placed. I decided to test out the app version of EatNow as these days almost everyone is constantly on their phone and use apps regularly to get things done. I downloaded the EatNow app from the Google Play Store and proceeded to start the app up. If you have your location services on your phone – the suburb of the area you are located in will come up, if not you simply enter either your suburb name or the postcode – then select your suburb. Next a list of restaurants will come up relating to your suburb. There are also two tabs that you can choose from – PICK UP or DELIVERY. I wanted to see the list of restaurants under DELIVERY. You can view at a high level the rating that fellow EatNowers have given the restaurants, as well as the cuisine (e.g. Italian, Pizza, BBQ & Grill, Dessert etc.) and dietary requirements – such as Gluten Free, Halal etc. Here you can also see which restaurants you can PRE-ORDER (this means that you can place an order with them before the actual restaurant is open or even for the next day) at as well as restaurants that have special DEALS associated with them. We felt like Thai food for dinner on Sunday night so we picked Swan Thai. Once you click into the restaurant you can browse their menu. If you are a regular and know what you want already there is a button located at the top right hand corner which says “Skip To..” – this allows you to go straight to the menu section you are after to choose your dish. From this page you can also view Customer Reviews and see any deals (if any) the restaurant has. I am not a regular so therefore I decide to scroll thru the menu. I see a dish that sounds delicious – Fresh Thai Basil Stir Fried – there is a description of the dish as well. 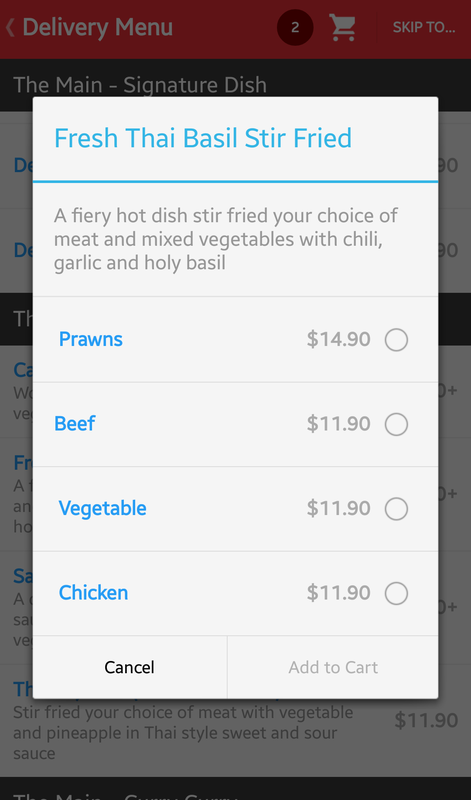 I click on this and a pop up appears allowing me to choose if I want Prawns, Beef, Vegetable or Chicken. One modification that I would suggest here would be a comments section if you wanted to make any modifications to the dish such as making the dish less spicy or spicier, or if you wanted to have both chicken and prawns in your dish. I did have a look at other restaurants and you get the option to modify dishes – such as with pizza’s – you can select which toppings you want to add and at an Indian restaurant it allows you at this stage to choose the spiciness. I pick Vegetable and then click the Add to Cart button. You can view your cart at any time by clicking the icon located in the top right hand corner. Once inside your cart you can easily use the + and – buttons to add extra quantity. The Cart also gives you a sub total. For first time users you will be required to click “Continue” – once you do this you will be taken to “Sign In” page – where you can register as a New User or login with your Facebook Account. I register myself as a new user. You receive an email confirmation about signing up to EatNow. 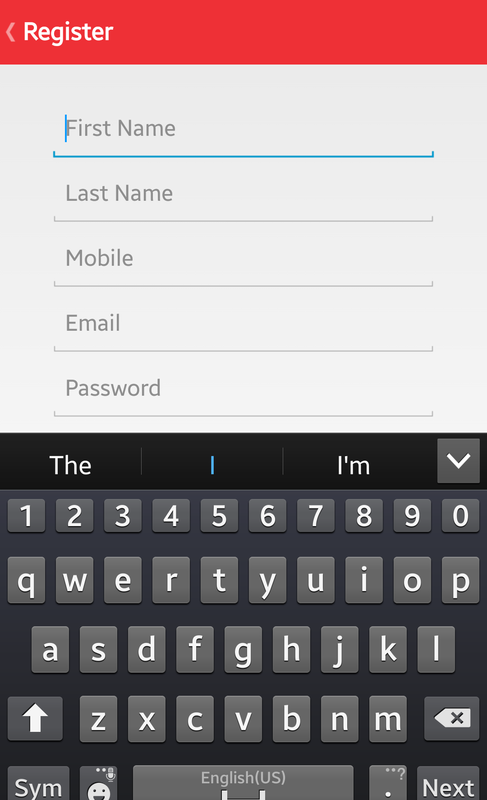 You then are taken back to the Shopping Cart page and this is where you fill in your Delivery Address, Mobile Number and enter your payment details. 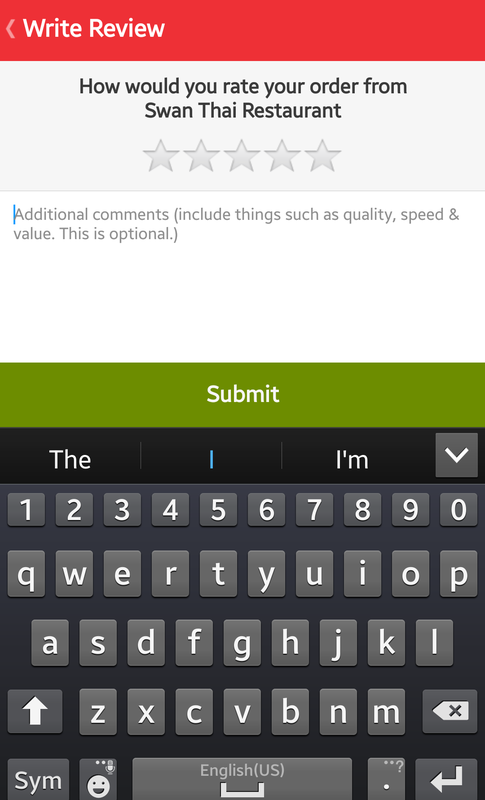 At this stage there is a Comments section where you can add any comments you want to make for your order. As I mentioned earlier I think it would be handy to do it at the dish level. Once you have entered all these details in and press Place Order you will receive a pop up that tells you that once the order has been accepted by the restaurant you will receive an SMS and an email will follow. About 1 minute later I receive an SMS telling me my order number as well as a delivery time (in my case it was 45 minutes). It also has the phone number of the restaurant in case we need to make any changes. I check my email and there is an email confirmation with the same details as well as giving you a tax invoice. 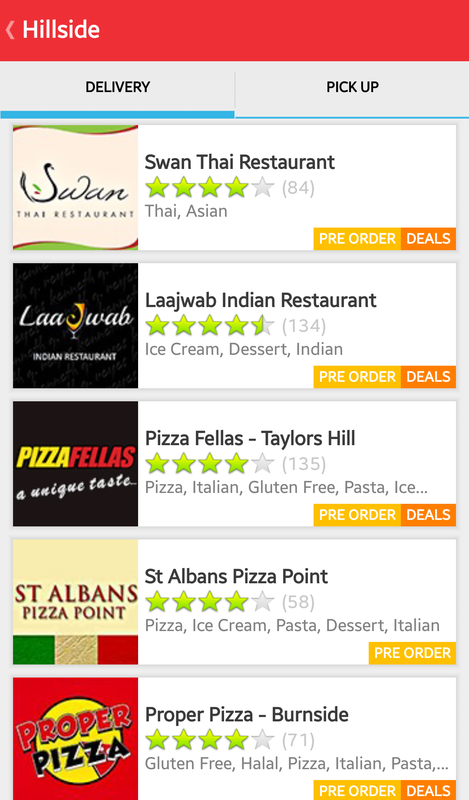 The home page of the app has the list of orders that you have put in so that you can view what you have ordered. There is also an option to re-order the same order that you have placed another time, as well as to leave a review for the restaurant. There is also a list that starts to populate with “My Recent Restaurants” which I think is handy to have if you generally are ordering from home and want to have it as your regular. The order arrives 15 minutes before its mentioned arrival time – so the order gets to me in 30 minutes. 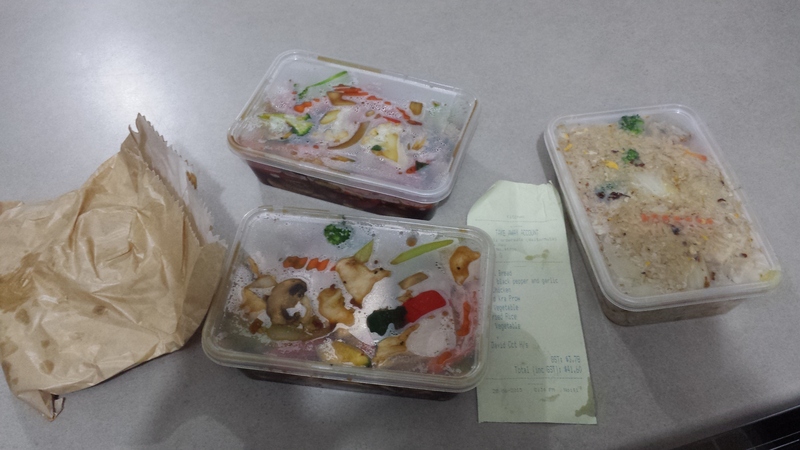 The food comes packaged well and was still very warm. 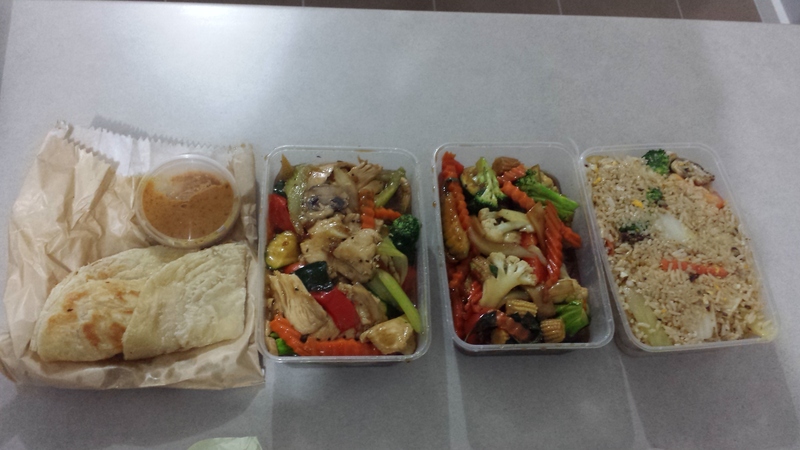 The fried rice and curries came in a plastic container with the roti in a brown paper bag. The Fresh Thai Basil Stir Fried Vegetable was delicious and spicy – just how we like it! The vegetables were fresh and crunchy. The Thai Style Fried Rice Vegetable and Black Pepper and Garlic Stir Fried Chicken were just as delicious – fresh, wholesome and all round tastiness. The Roti Bread was crunchy, crispy and came served with a satay sauce – perfect! 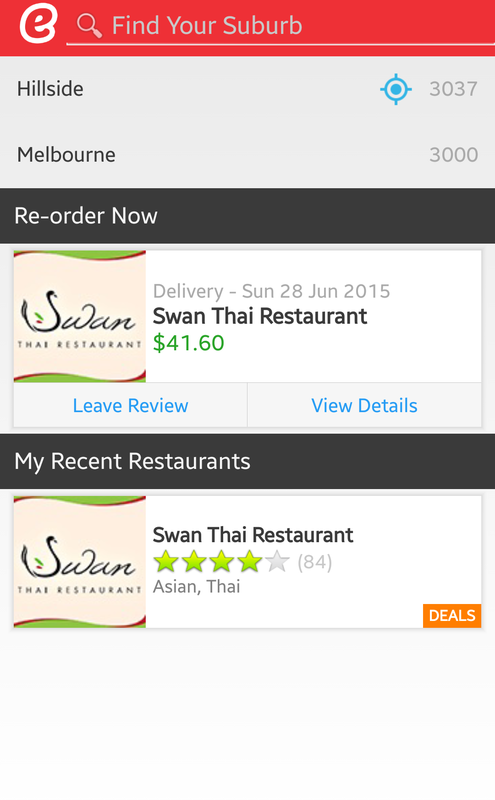 The experience with the EatNow app was brilliant – simple, intuitive and easy to use. I would definitely be using the app again to order in and would recommend it to everyone to try it out – especially for those lazy nights when you don’t feel like cooking or just want a late night snack. You can also subscribe with EatNow to save your details which greatly increases the speed and ease of ordering your takeaway next time and important updates – or follow them on Facebook and Twitter. Definitely 5 Pandas for service! These days the main topics of conversations that you hear a lot of are centred on exercise and eating healthy which includes smoothies and of course; products such as the Nutribullet, the Ninja, the Magic Bullet and any other intriguing fast paced named machines. Talking about what ingredients you put in your healthy smoothie each morning as well as learning about what specific fruits and vegetables combine to create the perfect flavour combination is all the rage. Welcome Melbourne’s first Superfood café Cupp – located in the heart of the CBD in the unique Manchester Unity Building Arcade (right near the corner of Collins and Swanston Streets). Cupp was created by owner Victoria Pajouhesh and specialises in blending natural superfoods and raw ingredients all whilst retaining 100% of the nutrients and creating a delicious and wholesome smoothie. Blending is seen as the healthiest method out there, even when compared to pressed juices which are known to lose a significant amount of natural goodness from the ingredients during the juicing process. There is a very personal story behind the creation of Cupp – which begins when Victoria’s mother was diagnosed with Ovarian Cancer at the tender age of 43. Finding out that the benefits from juicing could be useful in fighting this disease, Victoria helped her mother in trying an intensive course of juicing by making her a variety of juices a few times a day. She was dismayed at the amount of waste that was produced by this process as well learning that juicing strips the natural fibres of the fruits and vegetables leaving the sugar content to be very high. A few year after her mother passed away, Victoria discovered that she had inherited the BRAC1 gene and had an 85% change of having Ovarian Cancer and a 65% chance of Breast Cancer. It was knowing this that pushed her into wanting to start the juicing process early and fortunately for Victoria she happened to see a demonstration on blending fruits and vegetables together – using the entire piece and not having to get rid of the pulp. From this day on she would only have blended smoothies and it was her mission to pack as many superfoods and vegetables as she could together all whilst making them taste delicious. She also found herself feeling fuller for longer and not wanting to snack as much. It was this drive, passion and her husband’s need for wanting a healthy smoothie in the area that led to Cupp being created. Cupp blends are made from whole pieces of fruit and vegetables blended with natural yoghurt, coconut water and a choice of milk, plus superfoods like chia seed, linseed, oats or whole grains. They are created together with specialised nutritionalists to ensure that their smoothies and meals are nutritious, delicious, low in sugar and can be adequate meal replacements. The Cupps are made fresh daily and presented on shelves in store pre-blended, to show off their raw ingredients in layer form. Customers can then select the right Cupp for them based on the step-by-step blend guide in store (or by asking the friendly Cupp staff about each of the blends and their benefits). Cupp also has a large variety of salads, wraps and soups in store as well as on-to-go snacks like raw veggies, chia seed puddings, organic slices, protein energy bites and fro-yo. The Cupp store itself is small yet roomy – with limited bench seating located in store with more tabled seating directly outside the store. As you walk in you are greeted by the friendly staff behind the counter. To the right is an open display which showcases all of Cupp’s products from Salads, Puddings, Yoghurts and of course their range of blended smoothies. Cupp has recently developed a Kosher range to cater for the growing need and interest – showing their ability to adapt to their varying customer base. Another positive about Cupp is that everything is packaged separately – for example you can buy a boiled egg on its own, a combination of vegetables on its own, tuna on its own – which allows you as the customer to create your own lunch combination. The labels let you know what ingredients have been put into each dish as well letting you know what dietary requirements it covers which makes it a lot easier for customers. To order a blended smoothie you simply pick your Cupp, take it the counter, select your liquid that you want added to the Cupp, the friendly staff will then blend it for you and voila you are ready to enjoy your Superfood – Superfast! Cupp works together with many gyms and fitness venues in and around the Melbourne CBD and often creates fun events to showcase their vision and products. 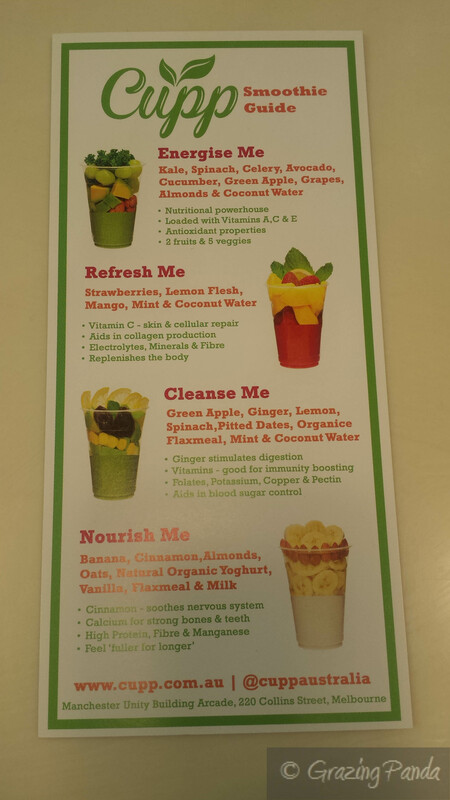 Cupp caters for a wide range of customers especially office workers as they can quickly create a blended smoothie as well as having a healthy lunch all ready and prepared for their customers to have on the go. I was lucky enough to be invited down to Cupp and speak to the owner – Victoria – as well as trying out their blended smoothies. Victoria is friendly as well as being both passionate and determined about getting the word out that healthy eating can be both fun and delicious and there shouldn’t be any bad stigma attached to it. She loves the idea that she can get her kids (and I’m sure any other children for that matter) to eat vegetables like spinac, kale when mixing it together with other natural ingredients and they have no idea that they are eating them! It just tastes that good! 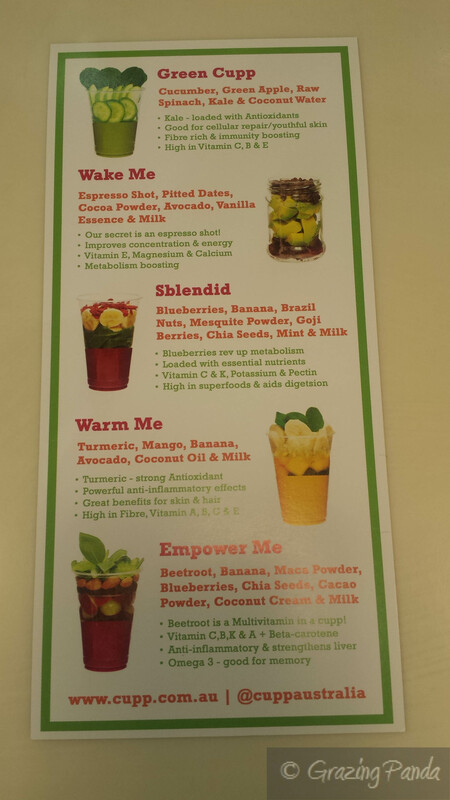 The Blended Smoothie Menu is great – it lists out each of the ingredients that are in the smoothie as well as outlining the benefits of each of the ingredients – which allows you to pick a smoothie to really target any areas that you feel are lacking. After looking at the menu for a good while (there were so many that I wanted to try) I finally settled on the Warm Me Blended Smoothie – Banana, Coconut Oil, Tumeric, Cinnamon, Ginger, Avocado, Mango and Almond Milk. I have never seen the use of Tumeric in smoothies before, so really wanted to see how it worked with the other ingredients. As the name states – the turmeric really does provide that “warming” feeling and is complemented by the other ingredients, all whilst not being too strong. I really enjoyed the blended smoothie – the sweetness from the mango coupled with the avocado and cinnamon were divine! I also got to sample some of the Cupp’s other products such as the Superfood Cupp Corn and Beetroot Chips. 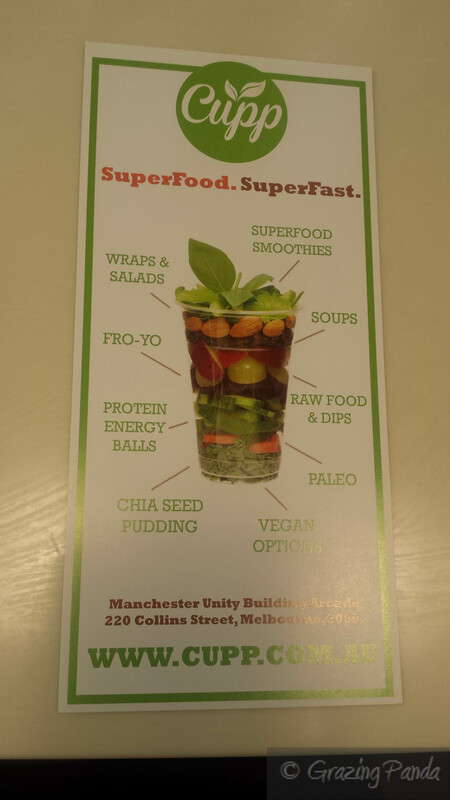 The Superfood Cupp Corn was out of this world AMAZING! Made up of Popcorn, Butter, Vanilla Essence, Chia Seeds, Cashews, Almonds, Pistachios, Coconut and finished with a Rice Malt Syrup – it was delicious. I loved the different textures that you got when you took a pinchful to put into your mouth. It was so addictive that you couldn’t help but finish the whole cup in a record time! If you love popcorn and always feel guilty eating the unhealthy version – you should definitely try Cupp’s version. The Beetroot Chips sounded interesting from the get go. Made simply using Beetroot, Thyme, Lemon Zest and Salt and baked in the oven. They tasted pretty good but I found that some of the chips were blackened a bit too much and therefore gave a “burnt” taste to it. Cupp is a great addition to the city and serves a range of blended smoothies and healthy meals which caters for a large variety of customers. They are looking to expand this customer base further by looking into creating meal plans that customers can tailor to suit them, as well as opening more stores. They love to support local business such as counsellors, beauty stores and gyms as well as sourcing local and organic ingredients. If you want smoothies with a difference, delicious and healthy snacks to keep you going through your work or uni day or even for a great tasting meal – then Cupp is the place for you. Also keep a look out on their Youtube Channel ( https://www.youtube.com/user/cuppaustralia) for fun workout videos, recipes and more! Disclaimer: Grazing Panda was invited to Cupp as a guest, however, opinions expressed here are purely my own and not influenced by them in any way. Hero Subs is brought to us by Michael and Eleena Tan who are responsible for The Grain Store. Hero Subs was inspired by Michael’s travels around New York City together with his fond childhood memories of being looked after by a traditional Nonna – eating food such as parmagianas – and putting what he finds special into food. Hero Subs specialises in oversized gourmet Brooklyn inspired subs – with a distinct Melbourne twist – that come in an array of fillings and flavours. The subs come in both half and full sizes and you can choose from a Brioche bun or a Baguette style (Seeded, White or Gluten Free). If bread subs aren’t your thing – you can have a wrap style (Chia Seed, White or Gluten Free). There are 11 different flavours to choose from – including #Sonny In Law (Sticky Fried Chicken, Kim Chi Slaw, Sriracha Mayo), #Kanye’s Revenge (150gm Beer-Battered Fish Fillet, Apple Slaw, Lemon Dill Aioli) and #KidRoyale (Hickory Slow Cooked Beef, Onion Jam, Baby Spinach, Honey Dijon Mustard and Crispy Onion Rings) just to name a few. Naked Salads, Potato Kris Cross Chips, Sweet Potato Kris Cross Chips, Onion Rings, Corn Fritters and Sweet Treats (Hot Ball Donuts – in Berry Jam and Salted Caramel) are also available. I ordered the #Cypress Chill – Corn Fritters, Green Goodess Spread, Baby Spinach – Diced Tomato and Herb Fetta Sub in the Wrap Style (Chia Seed) with a side of Potato Kris Cross Chips. The Kris Cross Chips were crunchy on the outside, flavoured well and soft like clouds on the inside. There is just something about eating chips in the shape of a kris cross that makes it more appealingly delicious. I really enjoyed the #7Grand Wrap – the corn fritters was perfectly cooked with the right level of crunch and consistency. I loved the combination of the spinach, fetta and the Green Goodess Spread – it was tanginess exemplified but not over the top. A really great tasting sub! One thing I would love to see on the menu would be some seafood subs – prawns or soft shell crab would taste delicious! Hopefully they start making them soon! Hero Subs are not just about the subs – they want to become a Lifestyle Brand – to run and organise music festivals, create a swanky clothing line, support fresh Street Art as well as to engage charities and organizations. They also have something called the Hero Social Programme – where every franchisees that joins the Hero family will commit to 10 hours of community service. What a brilliant idea – if only more companies were this encouraging. Atmosphere / Ambience: Funky and has a street-vibe to it! Tomboy is the creation from co-owners Pia Hambour (ex Movida) and Georgina March (Box Brownies) whose initial dream was to create a shopfront to showcase the wholesale baking business Box Brownies – a business all about gluten-free and dairy free sweet treats! Currently these goodies are provided daily to cafes such as Seven Seeds, De Clieu and Brother Baba Budan. Located in Smith Street, Collingwood, Tomboy has a rustic charm to it with a variety of pieces around the venue sourced from the Adelaide Hills (near where the girls grew up). There are many stylish one-of-a-kind pieces here at Tomboy – you will definitely find something that peaks your interest from any seat you sit at. As you step inside you will see a vintage milk bar sign that hangs over the front counter which came from an old Collingwood business as well as an old school white scale. The counter itself is quite unique – there are 1970s speakers built into the counter and surrounded by brick. These speakers belong to March’s stepfather. The communal table located at the back of the venue against the brick wall is my favourite – it is reminiscent of a workman’s bench complete with dents, scratches and metal vise’s. The surrounding tables remind me of garden bench tables coupled with seating to match. There are little touches that bring the whole recycled, vintage, relaxed feel together such as jars filled with flowers, a ladder that houses magazines and newspapers, mint green light shades hanging from thick shades and wooden boxes that house vintage books. Most fittings and décor items come from ops shops, antique stores and friends. There is a small courtyard located at the back for those wonderful summer or spring days. Both the owners are supportive of local artists and have one wall of the café dedicated to rotating exhibitions – the right wall has been plastered and painted white. The current feature comes from local street artist Drab and features a tattooed gangster “baby” with a mopey face and moustache, wearing a beanie – it is quite a feature and adds a great point of difference. I really love the décor and styling of Tomboy! This painting on the wall seems to tie into the front page of the menu and their takeaway coffee cups – which have portraits of the staff & friends illustrated. You then join in the fun of trying to find a portrait that resembles yourself- well at least I did anywhere. The menu (which tends to have a vegetarian flair) changes seasonally but generally always has the main staples such as fruit toast, multigrain toast, a sweet dish (either brioche French toast or waffles), breakfast bun, Poached eggs with sides, bagels, selection of sandwiches and a Tomboy Tart of the Day served with a Salad, along with additionally dishes that vary with each season. These dishes could include Spicy Red Wine beans with Goats Fetta and a Poached Egg on Toast ( you could add a pork and fennel sausage if you wish), Roasted Swiss Mushroom with Meredith Goats Fetta, Sautéed Kale, Hazelnuts and a Poached Egg or Lentil and Wild Rice Salad with Pistachios, Almonds, Roast Capsicum, Currants and A Lemon Harissa Dressing (you can add Poached Chicken). You can either find the menu located on a giant reel of brown butcher’s paper attached to the wall, as well as a more detailed menu that will be given to you at your table. The idea is to use vegetables that have been grown from the duos own vegetable patch as well as sourcing local suppliers. The meat dishes will be of the sustainable type which fits in with the healthy living ethos the duo follow. I order a latte to start whilst deciding on what I want to eat. Coffee is from Seven Seeds pumped out through a Synesso Hydra espresso machine, with a single origin also being. My latte is strong yet smooth with both nutty and fruity hints and was brewed to perfection. A really great tasting coffee. I was tossing up (once again) between a sweet or savoury dish – Elvis Waffles (Buttermilk Banana Waffles, Whipped Peanut Butter Mascarpone, Maple Syrup and a Peanut Brittle) and Crispy Potato Hash with Parsnip Puree, Grilled Asparagus, Kale Chips and a Poached Egg. In the end the savoury side won. The dish was well presented with the Parsnip Puree spread as the base of the dish with the grilled Asparagus artfully placed on top with the Crispy Potato Hash in a rectangular shape placed to its side. The Poached Egg sat on top of the Potato Hash with the Kale Chips placed around all the components described. The egg was poached perfectly and the gooey golden yolk drizzled over the crunchy potato hash. The grilled asparagus was perfectly seasoned and flavoured with the creaminess of the parsnip puree adding the perfect complement. The Kale chips added some extra saltiness to the dish and were sublime. All the components on the dish worked well together and overall it was a truly superb dish that I would recommend anyone to try. Looking for something sweet to eat then look no further than the front counter where the delectable delights from Box Brownie can be found – cakes, brownies and other bakes goods. All treats are gluten-free however you cannot tell by tasting them. If you needed another reason to come and try out Tomboy – then you should check out the quarterly publication the duo have put together – The Tomboy Paper – which keeps diners up to date on all things to do with Tomboy, Box Brownie and Collingwood. They have enlisted the help of creative directors Emily Gillis and Camille Moir-Smith from Yolk Studio. Tomboy exudes bucket loads of character and charm. The food displays uniqueness with its combinations of ingredients, the coffee is exceptionally brewed and the staff are friendly. Make Tomboy next on your list to visit. Pana Chocolate – Raw, Healthy, Handmade & Guilt-free! Pana Chocolate was founded by Pana Barbounis – who is passionate about raw and slow-cooked food – and following on from the success of his 45 gram raw, vegan chocolate bars has opened his first standalone raw-dessert shop. Pana Chocolate is a wonderful addition to the Church Street, Richmond area and serves up healthy handmade raw, delicious tasting and looking desserts, as well interestingly flavoured chocolate bars. Pana Chocolate uses natural, vegan and organic ingredients like cacao, nuts, coconut and 100% pure essential oils to create wonderful and unique flavour combinations – which include Fig + Wild Orange, Sour Cherry + Vanilla, Rose and Mint just to name a few. Prepare to be overwhelmed with the number of selections here which leaves you wanting to try out one of each. As mentioned before no desserts are made or sweetened with sugar but are all natural and made from plant-based, organic ingredients sourced from all around the world. Cacao beans come from the Amazon, Coconut Oil has been cold pressed in the Philippines, Dark Agave Nectar comes from Mexico, Cinnamon is organic and certified from Sri Lanka (where I am from!! ), Cacao Butter is organic, cold pressed and fair trade from Peru and organic carob comes from Spain. The space is simple and clean – with most of its offerings for takeaway patrons – however if you did want to eat in there is a row of seats available by the window looking out onto Church street. I love the décor of Pana Chocolate – there is an entire wall that is covered with clipboards that have cute, inspirational quotes and sayings on them. This adds color, brightness and wow factor in such an easy and simple manner. Such an awesome idea – Love it! There are 10 different types of chocolate bars to choose from– Eighty (80 % Cacao), Raw Cacao, Orange, Coconut + Goji, Fig + Wild Orange, Rose, Sour Cherry +Vanilla, Cinnamon, Nuts and Mint. All chocolates are low in GI, have no dairy or soy, are Gluten Free and are handmade. In fact they are all handmade in a small scale kitchen located at the back of the shop. A major difference with these chocolates is that you can envision and see the love and care that has been placed into each bar of chocolate or dessert for that matter – down to the packaging and wrapping of each individual piece – it has been done by hand and provides a human connection. I have tried the Sour Cherry + Vanilla, as well as the Fig + Wild Orange flavours. Between those two the Sour Cherry + Vanilla would have to be my favourite – the chocolate is smooth, silky and not overly rich and literally melts in your mouth – with the sour cherry adding a great tangy sensation that glides over your tastebuds. The Fig + Wild Orange was also great – the combination works brilliantly together and if you are into the citrus flavours this would be one for you to try. The piece of resistance at Pana Chocolate is the cabinet of goodies. The first row is full of their raw cheesecake / desserts of the day which are in a slice format, that can range from Raspberry Ripe (their version of a Cherry Ripe), Chocolate Strawberry & Rose, Spiced Apple, Blueberry & Ganache, Banana & Chocolate – these range from $6.50 to $8.50. Their second row has smaller bite sized treats such as Lamingtons, Lemon Slice (this is new! ), Pana Pop (more on this later), Brownie, Vespa Wheel (their version of a Wagon Wheel – complete with a buckwheat wafer biscuit and a soft coconut marshmallow centre encased in a gooey raspberry chia jam and dipped in cacao) and Fudge just to name a few – these range from $3.50 to $5.50. The third row is full of individual raw chocolates like hazelnut mousse, coconut barrels and truffles – in flavours such as Coconut & Mint Cream, Rose & Pistachio, Hazelnut Praline, Sneakers (yep spelt like this), Lavender & Macqui, Mango & Salted Caramel and Coconut Barrel – there are more flavours in store! At the very bottom of the cabinet are their chocolate bars in all the 10 flavours mentioned above for sale ($6.50). There are also other healthy goodies for sale – from coconut water, coconut + cacao balls to their very own hot chocolate sealed with the pana heart of approval. After marvelling at the cabinet of goodies and spending a good 5 minutes oohing and aahing I decided to ask the friendly staff member of what she thought would be good try out and settled on the Pana Pop as well as the Fresh Mint & Raspberry slice. The Pana Pop – was a white chocolate cheesecake with a berry centre coated in delicious cacao – represented a mini Magnum. From the very first bite you could tell this would be a memorable treat – the soft textured coating coupled with the creamy white chocolate cheesecake and zing from the berries worked perfectly together. You could almost eat the entire Pana Pop in one mouthful – but I would advise against this and instead treasure every mouthful; or you could just order another Pana Pop! The Fresh Mint & Raspberry slice was another winner. There were three distinct layers – the bottom layer being a combination of cashew and brazil nuts, the centre layer being the mint and the top layer representing raspberry. The consistency of all layers was dense yet smooth – with the perfect level of sweetness across all three layers. I couldn’t really taste the mint flavour that strongly – although the strip of green at the very top held quite the minty flavour. I love the use of the fresh raspberries through the raspberry layer which not only added texture but extra flavour. The base was wholesome and added further texture and flavour bringing the whole slice together. I enjoyed my time thoroughly at Pana Chocolate – I actually perched myself in a corner seat by the window and enjoyed these treats whilst working away on my laptop. On my way out I ordered a lamington to take away (as I had been told by a friend that these were simply superb!) which was packed away in a takeaway bag and sealed with a massive heart sticker – the Pana symbol – which I thought was really cute. Whether you are into healthy eating, have certain dietary requirements or not – Pana Chocolate is definitely a place to check out. It produces great tasting chocolate that have been lovingly prepared using quality ingredients for anyone and everyone to enjoy. 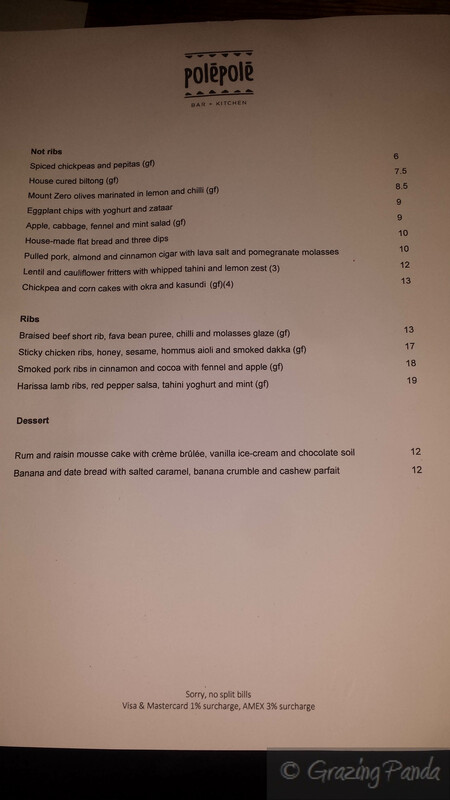 Menu – The dessert menu changes daily but no doubt whatever dessert treat you get it will be delicious! I had heard about Polēpolē – a new East African inspired bar and kitchen – opening up in the Melbourne CBD and four of us decided to check it out on a Friday night. Polēpolē (which translates to “go easy” or “take it easy” in Swahili) is the creation by Dean and Jeanelle Mariani (former co-owner of award-winning café The Petty Officer and Deans brother), who quit their jobs and went travelling. Polēpolē is a result of their love and admiration for the culture, food and people of East Africa and wanting to share their experiences with Melburnians. I arrived much later than the rest of us on a Friday night and the place was buzzing – it was really loud! N had told me prior to me arriving there that the place was packed and that it would be about 20 minutes to get a table for food (Polēpolē don’t take bookings for dinner). The venue was designed by Votre Monde and has resulted in an earthy and rustic vibe to it. As you ascend the stairs from Little Collins Street you are greeted by a painting of an African woman seated in black and white, against the red of the wall background. To the right is where the kitchen is located as well as booth seating for dinner – which is paired with a wall of zebra stripes. To the right is the bar which takes most of the length of the venue has tones of burnt orange, coupled with untreated woods and funky filament lighting. Next to the bar is a wall with a single golden acacia tree painted on it with high tables and more seating available. The building has a second level, which they expect to open in the coming months. Food at Polēpolē is based around sharing plates which are broken into three main sections – “Not Ribs”, “Ribs” and “Dessert”. 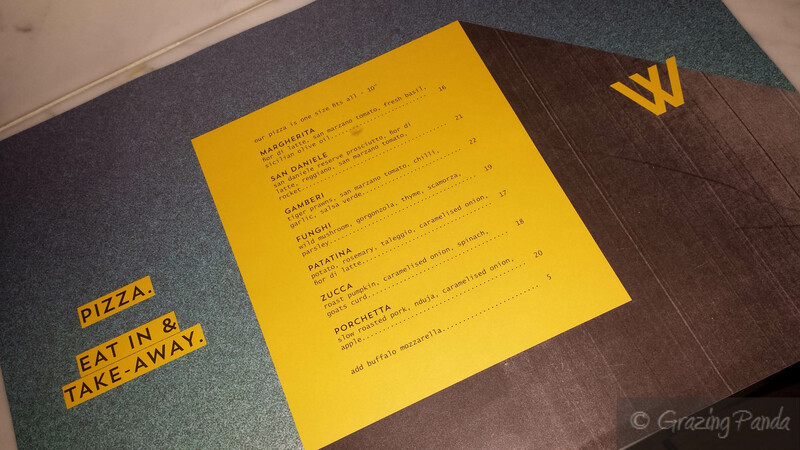 The menu was designed by consulting chef Andy Mac (Axil Coffee). There are 9 dishes to select from in the “Not Ribs” section which include Spiced Chickpeas and Pepitas, House cured Biltong, Lentil and cauliflower fritters with whipped Tahini and Lemon Zest. The “Ribs” section consists of 4 dishes including Braised Beef Short Rib, Sticky Chicken Ribs, Smoked Pork Ribs and Harissa Lamb Ribs. There are only 2 choices for dessert – Rum and Raisin Mousse Cake with Crème Brulee or Banana and Date Bread with Salted Caramel, Banana Crumble and Cashew Parfait. Drinks include a showcase of brands such as Tusker (Kenya), Dashen (Ethiopia) and Windhoek (Namibia) as well as German and Dutch style lagers. It is also great to note that a proportion of all beer sales go to YGAP who support social entrepreneurs in Africa, as well as Women for Women in Africa who support Kibera (Africa’s largest slum). There are a range of cocktails which have taken inspiration from their travels as well and consist of combinations such as ginger, honey, coconut and banana. To begin the night I ordered a mocktail – which had minty and lime flavours laced through it and was quite tasty. As the other 3 had already been there for a while before I had gotten there – there were some leftovers from the “Not Ribs” section that they had ordered – Mount Zero Olives marinated in Lemon and Chilli as well as the Spiced Chickpeas and Pepitas. I loved the Spiced Chickpeas and Pepitas – the flavours and the combination of textures from the soft chickpea and the crunch of the pepitas was great. We decided to order a selection of dishes from the Not Ribs section to share; and then the other 3 ordered a dish each from the Rib section (as their mains). As the meat wasn’t Halal I couldn’t eat any of the dishes under the Rib section. We ordered the Chickpea and Corn Cakes with Okra and Kusandi (which came in a serving of 4) – with each cake being topped with the okra and kusandi. The chickpea and corn cakes on its own didn’t have much of a flavour to them and really needed the strong and vibrant flavours of the kusandi to liven up the dish. An addition of some spices or even salt to the chickpea and corn cake would have made a difference. Next up was the House-made Flat Bread and Three Dips – the dips were beetroot, eggplant and hummus. The serving of the house-made flat bread was very generous and I really enjoyed this dish. The bread had been cut into triangles, and had a crunch to them and had a flavouring of wholemeal without tasting overly healthy. I couldn’t pick a favourite out of all the dips – they were all just as good as each other. I loved the vibrancy of the pink that came through with the use of beetroot. The smokiness in the eggplant dip worked well with the flavouring in the bread. We also ordered the Eggplant Chips with Yoghurt and Zataar. I am usually not a huge fan of eggplant chips but the difference with these was the crumbed coating which made all the difference. The hint of spice and herbs (zataar) worked well with the flavouring of the eggplant and the tangy yoghurt. I also liked the fact that they left the chips the same length as the eggplant itself rather than cutting up the pieces into bite size pieces. My only criticism would be the oiliness of the dish. The last of the “Not Ribs” dishes we ordered was the Apple, Cabbage, Fennel and Mint Salad. This salad was good but not great – for me it was missing a proper dressing to coat the salad. However I think dish is a great dish to have amongst all the meatiness of the ribs – acts as a palate cleanser. N ordered the Harissa Lamb Ribs, Red Pepper Salsa, Tahini Yoghurt and Mint – which were simply yet beautifully presented on a rectangular plate with the lamb ribs criss-crossing each other and topped with the red pepper salsa and tahini capped with a mint leaf. The lamb delicately fell off the bone and had smoky barbeque and spicy flavouring to them. We were all quite full at this stage so decided to skip on having dessert. As it was a Friday night it was getting quite loud in there, and even though we were sitting quite close to one another we were finding ourselves having to yell to hear each other talk. Polēpolē has a great vibe and feel to it and is clearly a popular choice to have a drink especially with its variety of drink options available. The service is brilliant – with the wait staff going above and beyond what is expected of them. The food is tasty and is set out to work well with drink options. Want to trial a Taste of Africa – then head to Polēpolē. Atmosphere / Ambience: Funky, Rustic and Earthy. Great for a catch-up celebration.